A culture of machismo has traditionally left many Nicaraguan women jobless. Now the country is trying to bring them off the sidelines. Ana María Hernandez wakes up every day at 3 a.m. to make tortillas that she sells during the day at her store on the outskirts of Managua, Nicaragua’s capital city. In the past two years, Hernandez has seen her business grow from a tortilla stall to a store that also sells milk, cheese, soups, tamales and meat. “I feel happy because I no longer depend on anyone for work,” said Hernandez, who is 83. Usura Cero is part of a broader effort by the Nicaraguan government to tackle a problem that exists across Latin America: a culture of machismo that has left many women on the economy’s sidelines. Forty-eight percent of adult women in Nicaragua participate in the labor force, compared to 80 percent of men, according to 2014 data from the International Labor Organization. (In the U.S., the gap is much narrower: 56 percent of women work compared to 69 percent of men.) According to a 2015 survey from the polling firm Latinobarometro, 43 percent of Nicaraguans believe that women should only work if their partner doesn’t earn enough. A separate 2014 poll from Gallup found that 57 percent of people in Nicaragua believe women are not treated with respect and dignity. Across Latin America as a whole, 61 percent of people said women are not treated with respect and dignity, by far the most of any region worldwide. Now Nicaragua is working to change machismo culture — and it may be setting an example for other Latin American countries. In 2008, the Nicaraguan government announced a new gender-equality agenda, which now includes at least 20 programs, according to a report by Nicaragua’s International Foundation for Global Economic Challenges (FIDEG), a nongovernmental organization. Besides Usura Cero, these policies include efforts such as financing state-run child-care centers for working women and providing seed capital for female-run startups. The programs seem to be making a difference. Since 2006, Nicaragua has leapt up the World Economic Forum’s Global Gender Gap Index,4 moving from number 62 to number 10 in 2016. The country saw significant improvements across all dimensions: political, economic, educational and health. Nicaragua now ranks above the Netherlands, Denmark and the U.S. in the index. Within Latin America, Nicaragua has been the best performer in the region for the past five years. Other indicators tell a similar story. The United Nations Economic Commission for Latin America and the Caribbean estimates that Nicaragua has one of Latin America’s smallest median income gaps between men and women. Additionally, 54 percent of micro, small and medium businesses in the country are owned by women, according to recent government data. These businesses are critical to the Nicaraguan economy, contributing 40 percent of the country’s total GDP and providing over 72 percent of total urban employment. Another government policy that helps increase women’s economic empowerment is the Land Administration Project (Proyecto de Ordenamiento de la Propiedad, PRODEP), which was launched in 2003 with the goal of promoting land ownership in rural areas. Nicaragua’s economy is heavily reliant on agriculture, but its land has historically been in the hands of men. From 2003 to 2009, in the pilot areas where the program was run, the number of rural women who received land titles increased by 50 percent, according to a World Bank study of the PRODEP program, which also found that land productivity had increased under the program. Promoting gender equality in the labor market is an economic imperative as well as a moral one, particularly in developing countries such as Nicaragua. In their paper, Cuberes and Teignier estimate that the income losses due to gender gaps are substantially higher in developing countries than in OECD countries. Cuberes said that policies such as Nicaragua’s that make it easier for women to work — paid maternity leave, child support and equal access to financing — help increase productivity, especially in countries with low fertility rates. 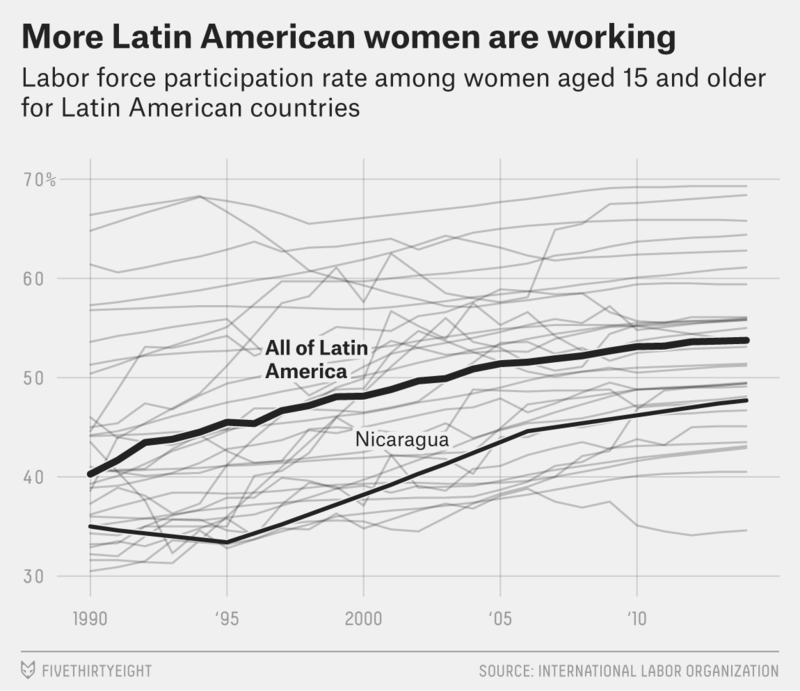 Latin America as a whole is making progress in bringing women into the workforce. In 1990, 40 percent of women in Latin America and the Caribbean participated in the labor force; by 2014, that share had risen to 54 percent. The World Bank estimates that if women’s labor income had remained stagnant in the region between 2000 and 2010, extreme poverty would have been 30 percent higher, holding all else constant. But Gloria Carrión, program director for FIDEG, says that Nicaragua and the region still face significant challenges, despite recent advances. Moreover, the jobs women are doing are often informal, so they don’t offer benefits such as health care or the protections that come with formal employment. According to the World Bank, 78 percent of employed women in Nicaragua work informally. (This type of job is common in Nicaragua — 72 percent of employed men work informally as well.) That informal work often includes small-scale entrepreneurial ventures like Hernandez’s tortilla store. “The fact that there’s more female employment doesn’t mean that the quality of the employment is any better,” said Callejas. Closing the gap the rest of the way will require a cultural shift that goes beyond labor policies, said Alma Espino, an economist and civil adviser to UN Women. “We need other policies to make sure women can participate in the workforce in the first place, such as funding state-run daycare centers or encouraging co-responsibility between women and men in household responsibilities,” Espino said. Recent research has found that microloan programs like Usura Cero aren’t effective at reducing poverty. They do, however, tend to boost entrepreneurship, which can have other economic benefits. Member countries tend to be wealthy and only one — Mexico — is in Latin America. Some regions would see even bigger gains. Teignier and Cuberes estimate that closing the gender gap would boost per-capita GDP by 25 percent in South Asia and 38 percent in the Middle East. The World Economic Forum produces the annual Global Gender Gap Index, which ranks countries according to how well their women and girls are faring based on economic, educational, health-based and political indicators.